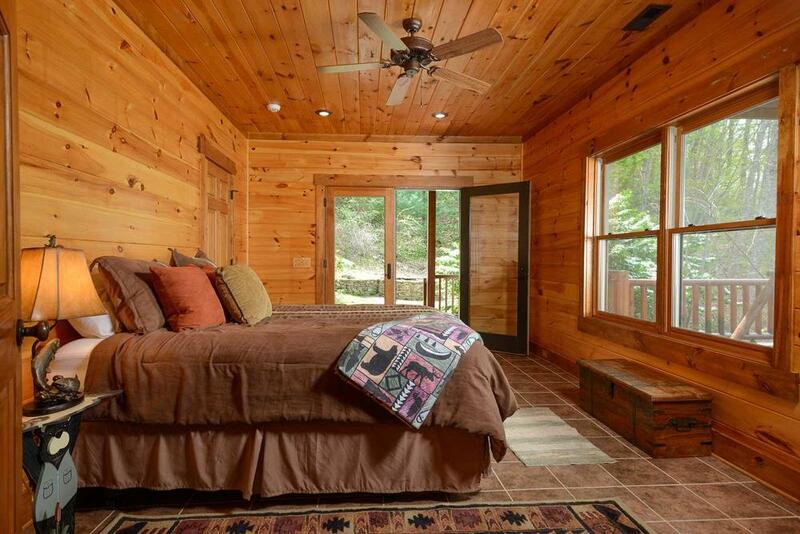 Take in the breathtaking beauty of natural surroundings and the serenity of a lodge situated against the National Forrest. This custom home captures your attention and your heart before you even step through the front door. Eagles Landing promises a unique and memorable vacation experience. 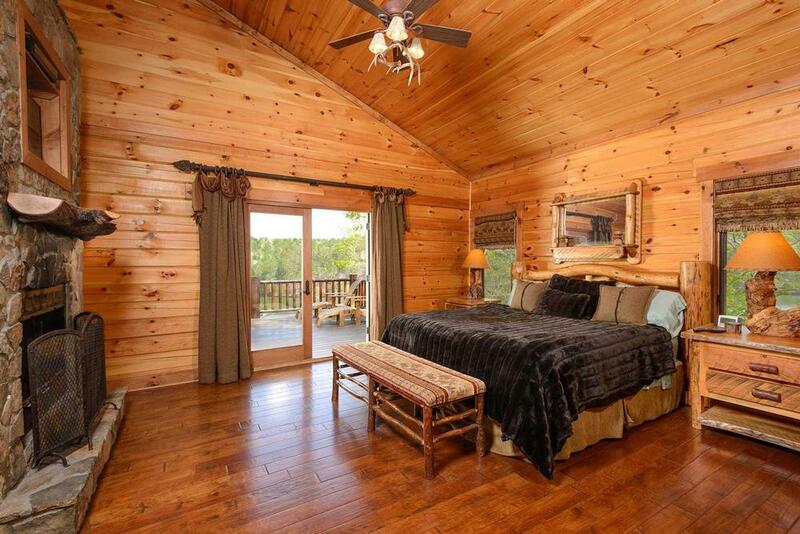 Discover why so many visitors have commented that this vacation spot has been their favorite, for relaxing and enjoying lake living. 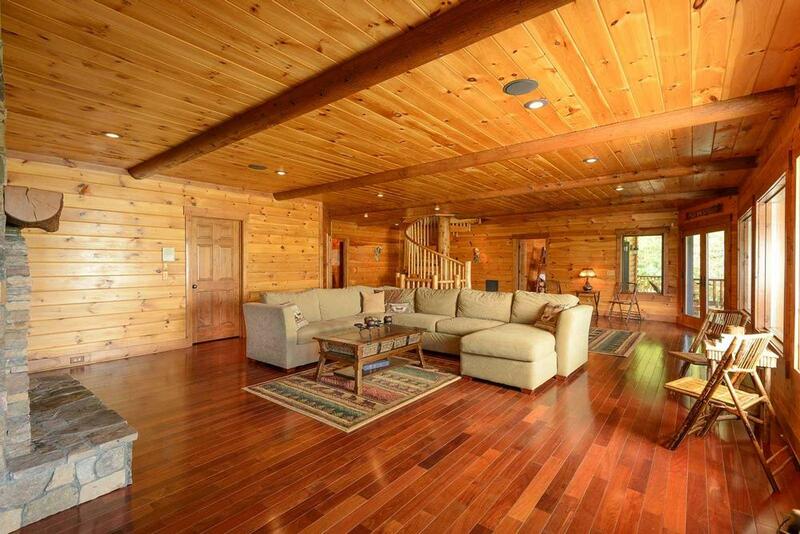 Situated directly on Lake Blue Ridge, this spectacular showplace has incomparable views of the surrounding mountains. Named for a bronze sculpture of a bald eagle that sits outside and welcomes your arrival and the real family of bald eagles that nests nearby, Eagles Landing is as bold, majestic and unique as the national symbol and as beautiful to behold. 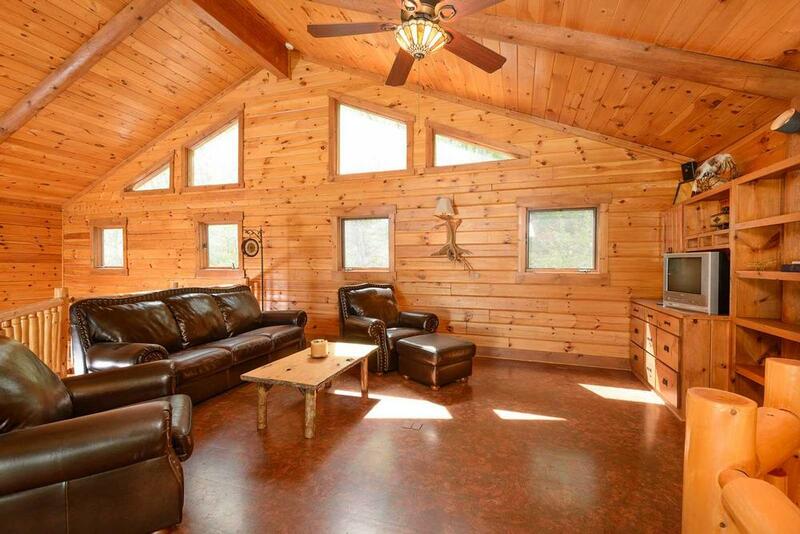 The epitome of rustic elegance, this spacious lodge has seven bedrooms to accommodate 19 guests, making it ideal for large families, reunions, couples’ weekends or getaways with all your friends. By day, enjoy boating and swimming at the lake and all the activities the nearby Aska Adventure Area has to offer. Unwind afterward with good food, conversation, and entertainment indoors or under the stars. Whether inside or out, enjoy views and privacy that cannot be found anywhere else. 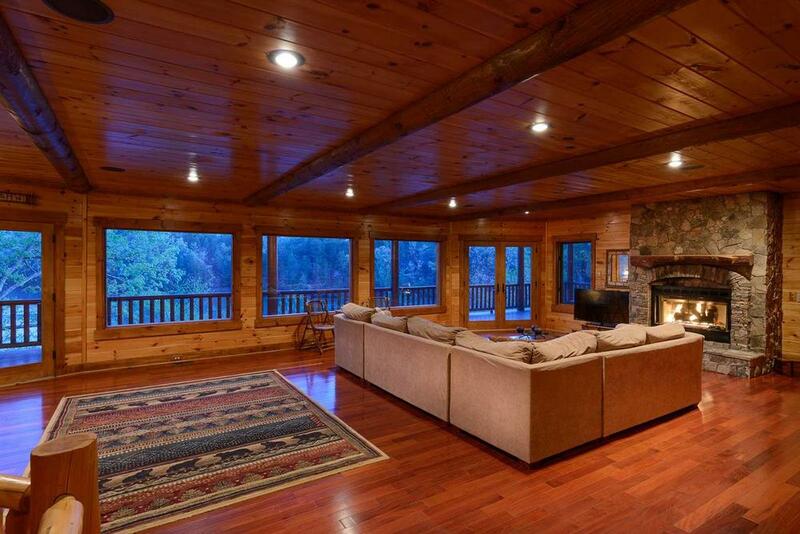 At the center of Eagles Landing is the signature living room that has a stone gas fireplace that stretches up 18 feet. The hand-carved spiral staircase spans four floors, from the unique loft down to the terrace level where you will find the “grown-ups’ game room”. 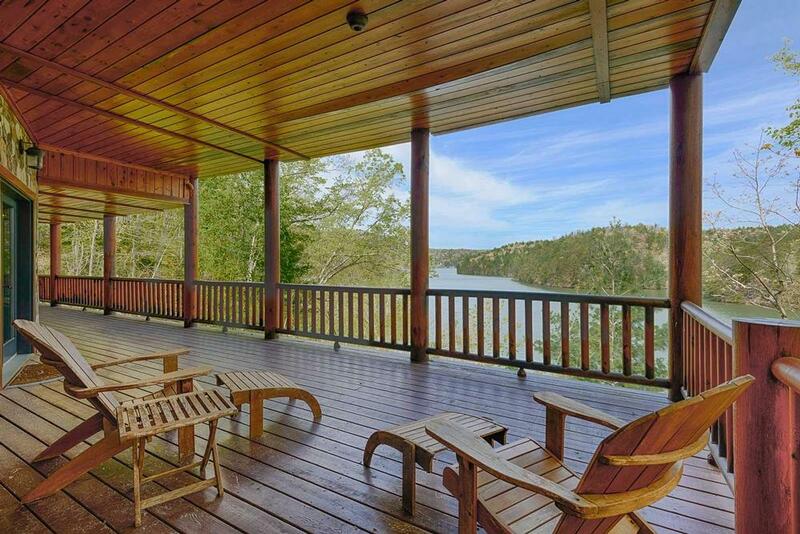 There are three decks spanning the length of the home, a hot tub, swings, and a picnic table outdoors seating 10. The kitchen, with its granite countertops and double sinks, makes cooking for a crowd a breeze, and there’s seating for a dozen, between the dining table and the kitchen bar. 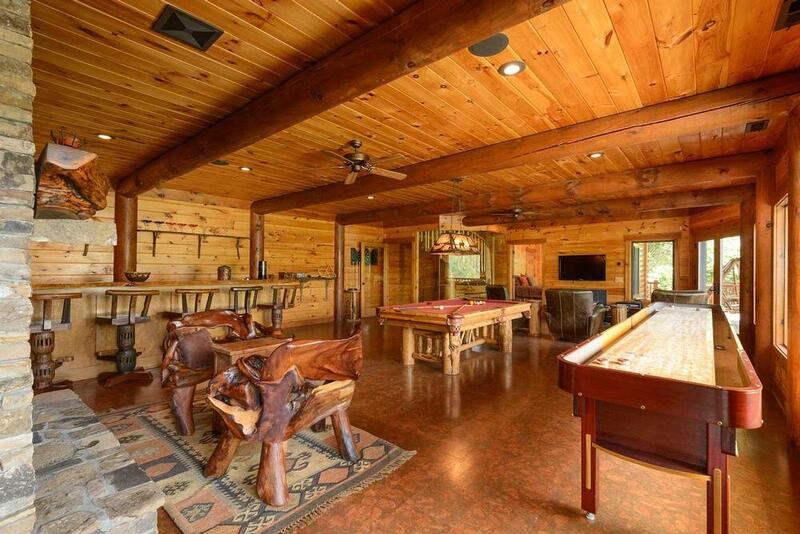 The cabin is equipped with high speed wireless Internet, several large flat screen TVs including one in the game room, where you can play billiards, shuffleboard, and chess. The two story dock has furniture enough to accommodate 16. Enjoy a picnic on the water, fishing directly from the dock, taking a ride on the paddleboat, or swimming. There are two ramps for watercraft, as well accommodations for a motorboat. Whether watching the skiers and wakeboarders, or watching an incomparable sunset, you’ll spend as much time as possible on the dock. When you’re ready to turn in for the night, a pleasant slumber is guaranteed because Eagles Landing’s bedrooms are warm, inviting and restful. 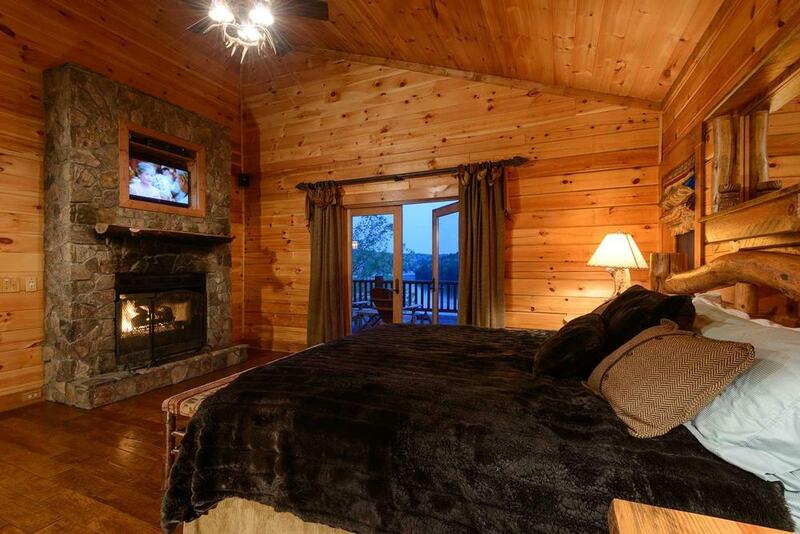 There are two master suites, both with king log beds, outdoor decks, private baths with double stone vanities and walk-in showers (plus fireplace and flat screen TV in the upstairs suite). 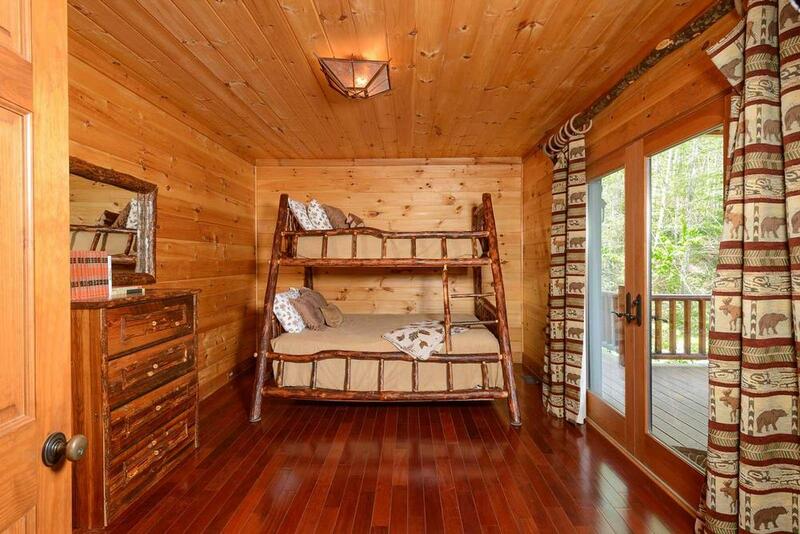 The other bedrooms have king, queen, full, and twin beds or bunk beds that the kids will adore. 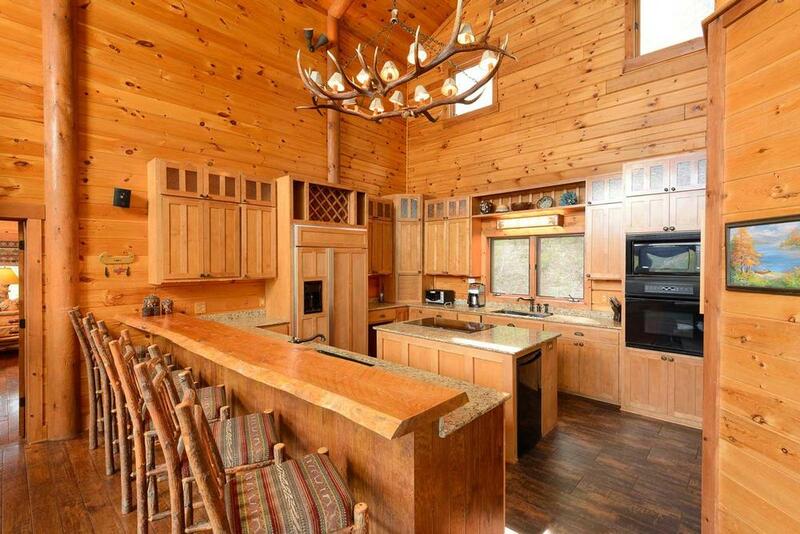 What else can we tell you about this one-of-a-kind lake cabin? There’s plenty of driveway space to accommodate your guests, and a washer-dryer for your laundry needs. But the most important thing about Eagles Landing is the way you’ll feel when you’re there: peaceful, one with nature, like you’ve escaped to a magical place—a memory you’ll cherish long after you’ve left. 02/19 - The scenery was absolutely beautiful. There was plenty of room for everyone to be comfortable and the game rooms was a big part of the fun we had there. Awesome company and customer service. We will definitely be repeat customers! 01/19 - The cabin was very spacious, and gorgeous. The game room was a huge bonus. Everything was fantastic from beginning to end. The staff and the cabin were excellent. 09/18 - The home was gorgeous with the views and interior layout. It was very enjoyable working with your organization and I have recommended you to friends. If we come back, your company would be our go to. 08/18 - Enough rooms to accommodate multiple families. 08/18 - The view is amazing! The location on the lake is amazing! The house is huge and comfortable. The company is super nice and friendly. Booking is easy and worry free! 07/18 - We liked the view, the size of the cabin, the game room, being close to town, and having access to the lake. The staff were very friendly, responsive, and accommodating. 07/18 - Loved the Lake... everything!!! Staff are very nice and professional. 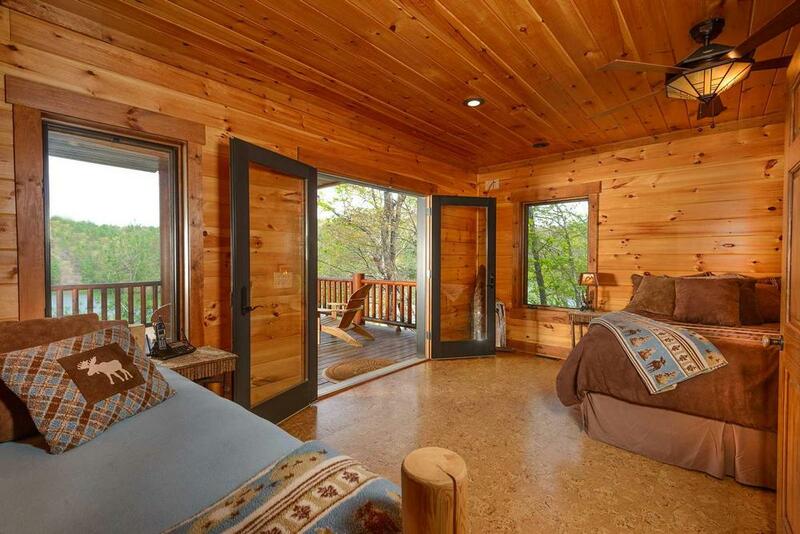 06/18 - A very roomy cabin on the lake with a fantastic view. Seven bedrooms with many having a private bathroom. This was our fourth year using EBR. It is an outstanding company to deal with. I want to especially praise Jenny and and Jennifer for their superb service. Liked the view, location and size of the cabin. Excellent company, pleasure to work with and will definitely use again. 09/17- The view was gorgeous. 08/17- It's a beautifully situated place on the lake. It is spacious - many places to find a cozy spot. There are a lot of bathrooms. Great for our large family group. Very well done. Enjoyed my interactions with the company. 07/17- The view is amazing!!! The home is really incredible. 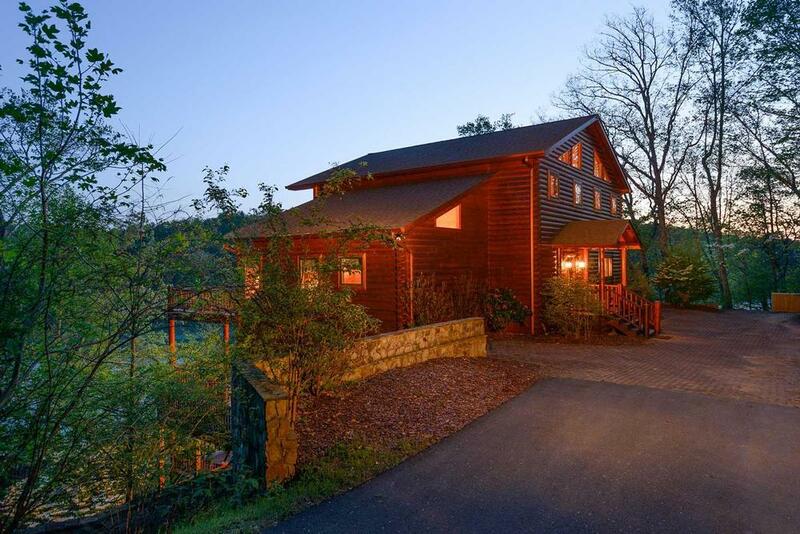 The home itself does have the million dollar wow (like the cabin we stayed in last year), it feels homey and comfortable this combined with the view makes for a great vacation rental. 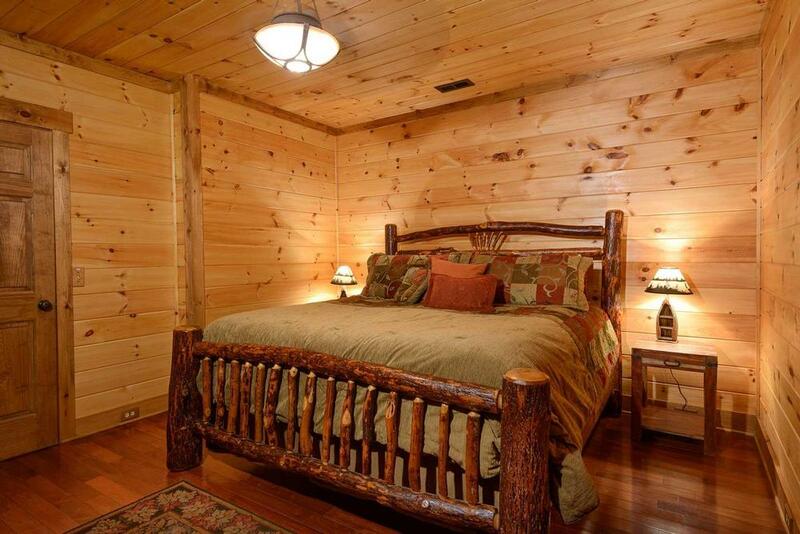 The bedding & towels are excellent quality for a vacation home I was very impressed. We loved every thing about this home! Thank you and we look forward to coming back next year. 06/17- The spaciousness of the home and dock are wonderful. This home is well stocked and everything is labeled. That makes such a difference-you don't have to wonder which light switch does what. This owner also had drawers labeled in the kitchen and pantry. A huge help. Your employees are ALWAYS helpful and knowledgeable of the properties. This is a huge help. They are always willing to assist in any way possible. Ya'll run a good group. We have rented with your company for several years and have always been pleased. 04/17- What an amazing cabin! Our group just loved it. The floating dock was a total bonus. We even caught fish, used the canoe and of course the paddle boat. 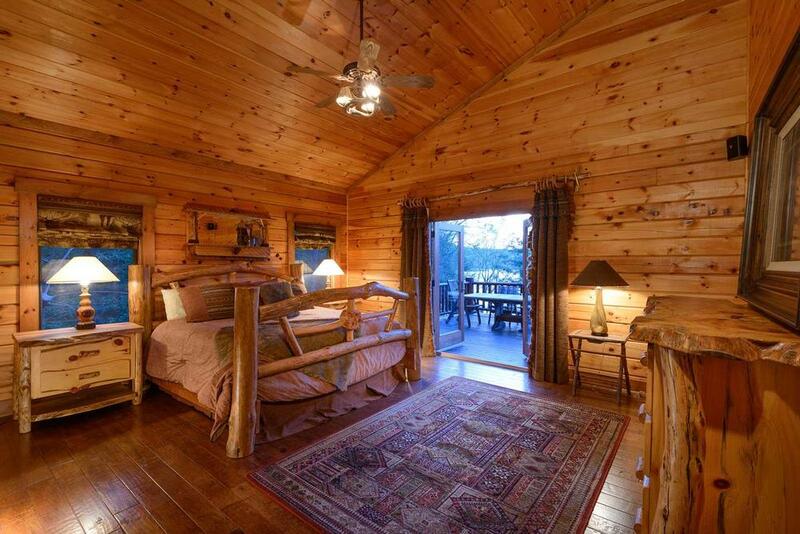 We never had to leave the cabin - had everything you needed. The road is a little tricky to access the cabin but we will for sure be coming back!! We love Escape to Blue Ridge and plan to continue to use your services. We come to blue ridge 4+ times a year. Thank you ! 04/17- The home itself is beautiful, and the location is paradise. We had a number of rainy days in which we chose to just stay in the cabin, and that suited us fine. I found I didn't want to leave. So I guess the cabin itself with its beautiful view is what I enjoyed most. On the cool but dry evenings, I spent considerable time sitting on the deck enjoying the starry sky and the sounds of nature. I would use your company again in a heartbeat. 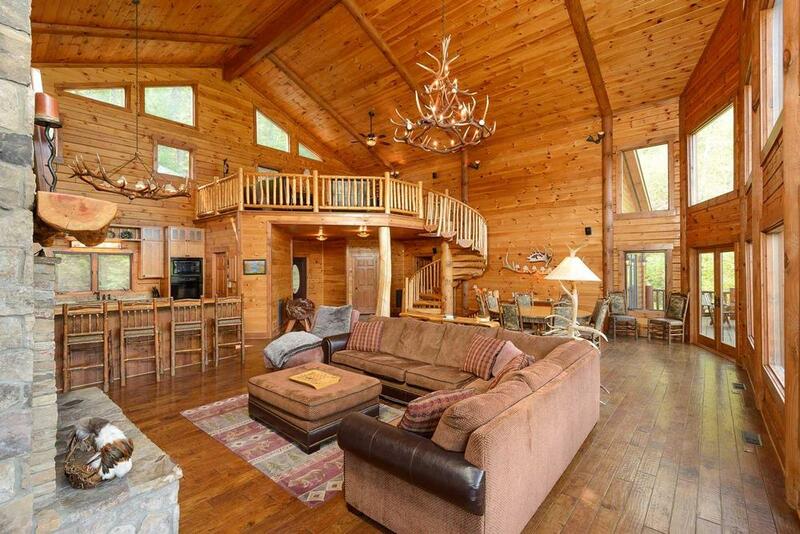 It has been a long term dream of mine to have a log vacation home, and if I did own one, or if I ever do, I would use Escape to Blue Ridge to rent it out. 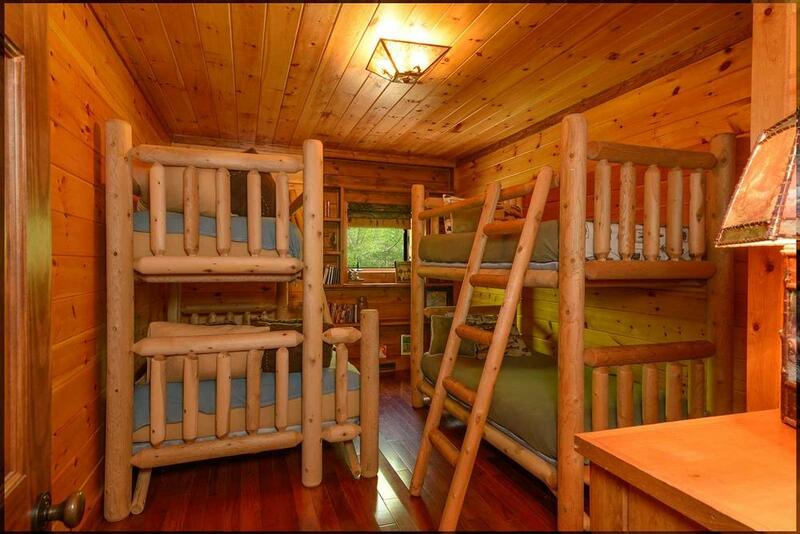 03/17- Spacious cabin, beautiful views, lots of amenities including a sound system, comfortable beds, comfortable couches. Use you every year for my trip to Blue Ridge - always recommend! 02/17- The view was breath taking!!! The beautifully crafted furniture was amazing!!! EXCEPTIONAL!!!!!!!!! 01/17- We loved the open floor plan along with the various floors for varied activities. Jennie was a pleasure to work with. 09/16- The home was large enough to fit our entire group. Everything was clean and modern and the views of the lake were spectacular. The location on the lake was perfect also. The staff are responsive, friendly, helpful and great to work with. We would like to rent the same house next year for our annual retreat. 09/16- Loved the size of the cabin and the view. 08/16- It was a beautiful home on a great setting. Plenty of space and perfect for our needs. I was very impressed with your company. When I needed assistance I could get someone on the phone but the best part was I did not need much and most everything went as planned. Thank you and we will be visiting again soon I am sure. 07/16- Appreciated the space available to our family. 04/16- The amount of space in the home was fantastic, there was never a crowded moment. The view and the privacy was excellent. The amenities were great to have without extra rental costs. 01/16- The interior natural log detail. Your staff was excellent. We had an issue with the main fireplace not working. Gabby and others followed up and made it happen after 9 pm. Very impressive. 01/16- We loved the view, game room and fireplaces. Dock is very nice. 11/15- I was impressed by the cleanliness,equipment and amenities provided. 11/15- We hosted a corporate event here and had a great meeting. The home is beautiful and very comfortable. The atmosphere was relaxing and and inviting. 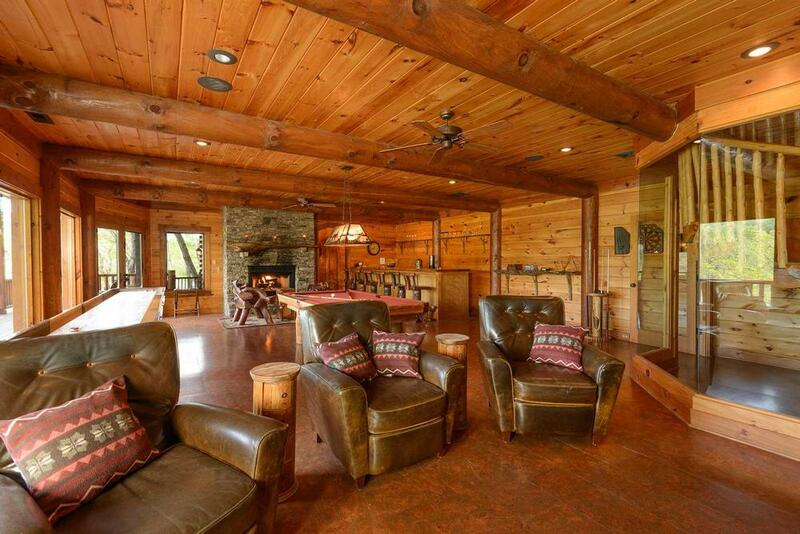 I would highly recommend this home for corporate events or large groups. Excellent company. Very responsive and attentive. Excellent to work with! 08/15- Eagles Landing was extremely awesome!!!! It more than exceeded my expectations. Very roomy, very spacious. Five beautiful decor levels of serenity. Loved the Kitchen's double sinks. 07/15- I enjoyed the peace and quiet. Plenty of fun things to do around town but really liked that we didn't have to leave the cabin for fun activities. A+ company as a whole. Very friendly and knowledgeable staff. We really felt as if we were VIP's while we were there.